How to easily process large amounts of geo-data for your own purposes? actinia is the solution! 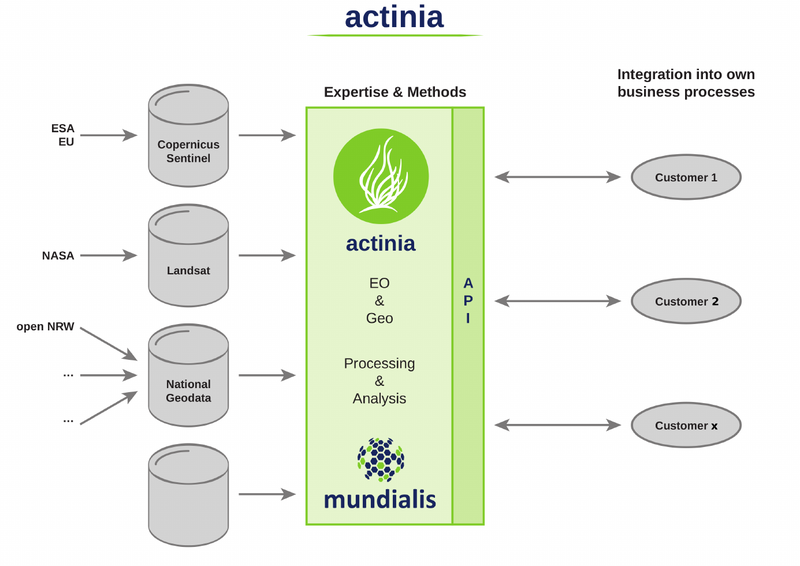 The cloud based geoprocessing platform actinia is able to ingest and analyse large volumes of data already present in the cloud. Due to the scalability of the cloud platform insights and tailor made information are delivered in near real-time. The mundialis computing platform processes big data quickly, reliably and with high quality. Thanks to our REST API you can integrate data processing into your own business processes. Users can draw data from a huge data pool on request or independently. This data pool is continuously fed by NASA, ESA, the EU and national institutions. actinia is constantly accessing all satellite data updates of these organisations and is currently interrogating about 30 datasets. Cloud-based parallelization enables fast calculation. The areas of application for the new computing platform are diverse, e. g. in the area of participatory urban planning. Remote sensing data is essential as a decision-making aid for deciding how to make a city more attractive. actinia provides data on building density, the proportion of urban parks and other relevant information – with just one query. Another field of application is digital agriculture. Here, too, GIS real-time solutions save valuable time, costs and resources for optimum crop yield. With the help of images taken from a greater distance, land degradation or drought can be detected in good time and thus crop failures can be avoided. actinia also provides data on weather and climate so that sowing, fertilising and harvesting can be optimally controlled. Resources can be addressed using HTTP GET, PUT, POST, and DELETE requests. Contact us for exploring actinia!